Friday's Soldiers Massoud Kimiayi, 2004, 98 mins. Hamoun Dariush Mahrjui, 1990, 117 mins. Last Supper, The Fereydoun Jeyrani, 2002, 96 mins. Soul Mate Mehdi Fakhim-Zadeh, 2004, 110 mins. 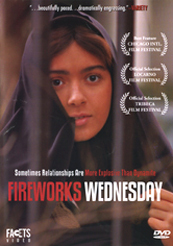 Ten Abbas Kiarostami, 2003, 90 mins. House Is Black, The Forough Farrokhzad, 1962, 22 mins.